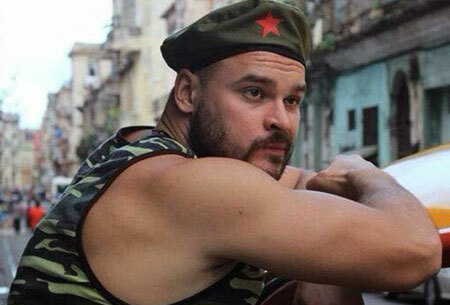 HAVANA — The leader of the anti-gay Russian extremist group “Occupy Pedophilia” has fled Ukraine, where he was hiding to avoid arrest by Russian authorities for a series of criminal homophobic assaults against LGBTQ people, and is now believed by Russian law enforcement to be hiding in Cuba. A member of Russia’s Security services told LGBTQ Nation on Friday that Russian law enforcement has confirmed that Martsinkevich is in the Caribbean island nation, however the official, speaking on condition of anonymity, declined to say whether Russian authorities would be asking the Castro government to extradite Martsinkevich. Martsinkevich claimed on his Russian social media VKontakte (vk.com) page that he was in Cuba as early as December 10. An consular official with the Cuban mission in New York told LGBTQ Nation that according to the visa agreement between Russia and Cuba, Russians are allowed to stay without a visa for 30 days. The official did note that Friday [today] would be the last day possible for Martsinkevich to remain legally without a petition to the Cuban government for a status change other than that of simple tourist. He declined comment on Martsinkevich’s situation. Martsinkevich also claimed on his VK.com page that he flew from Kyiv, Ukraine to Havana via Frankfurt, Germany. The Russian official noted that there is an active Interpol warrant for his detention and law enforcement officials suspect he is traveling on a false or altered passport. “This may be how he [ Martsinkevich ] avoided detection and arrest in Kyiv and by German authorities,” the official told LGBTQ Nation. Russian authorities initiated criminal proceedings in November against Martsinkevich for several homophobic assaults on LGBT persons inside the Russian federation by his group, which included attacks on citizens from Ukraine, Iraq, and South Africa. He has been charged under Part 1 of article 282 of the Russian Criminal Code, Incitement of ethnic and social hatred. The charge is punishable by a sentence of 3–5 years imprisonment if convicted.